Happy birthday Dundy! 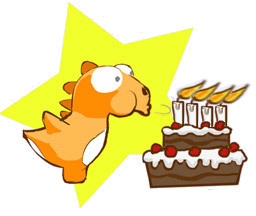 Today Dino Rush is celebrating its 4th birthday! To celebrate this event we are setting the game free, but for a limited time only! Tell yours friends to hurry getting their free Dundy on the app store! We have other good news : we are still working on Dino Rush updates, a major one should come in 2015. And in the meantime we have a new game which is near going into a public beta. If you want to preview it, it will be announced on twitter first, follow us!